FORT WORTH, Tex. 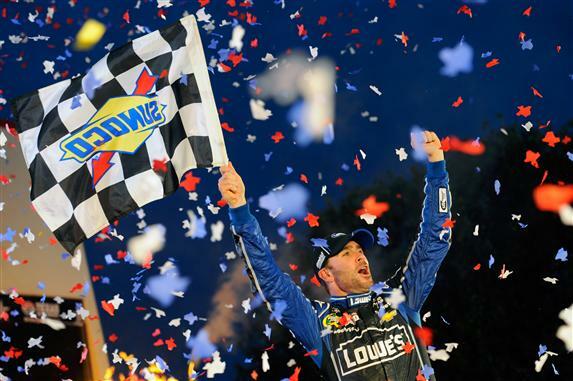 — The speed in Jimmie Johnson’s No. 48 Chevrolet was positively jaw-dropping. Able to pull away from his pursuers with apparent ease, Johnson finished three positions ahead of Matt Kenseth in Sunday’s AAA Texas 500, breaking a tie for the lead in the Chase for the NASCAR Sprint Cup, but — make no mistake — Johnson’s performance amounted to a brutal bludgeoning of Kenseth and the rest of the opposition. Kenseth hurt his own cause with a pit-road speeding penalty, but not even a perfect day on pit road likely would have overcome the dominance of the five-time champion, who led 255 of 334 laps en route to his third victory at Texas Motor Speedway, his sixth of the season and the 66th of his career. With two races left in the Chase, Johnson heads to next Sunday’s event at Phoenix with a seven-point lead over Kenseth, who rallied from the speeding penalty he incurred on Lap 173 to finish fourth. Similarly, Johnson left Texas last year with a seven-point lead over Brad Keselowski — and lost the title. But the emphatic nature of Johnson’s win on Sunday sent an unmistakable message. “We came here and tested and did an awesome job of understanding what I needed in the car and what was going to create speed,” Johnson said after the race. “We came back and had a very smooth qualifying session and practice sessions (Saturday), and just kept putting more and more speed in the car. Despite the emphatic whipping he administered to the rest of the field, Johnson is anything but overconfident. “I’ve been watching a lot of MMA fighting lately, and you’ll fall into a rhythm and think that somebody has got the fight won, and it doesn’t end that way,” he said. “That’s how this is going to be. Matt didn’t have maybe the best day and still finished fourth. This thing is going to go to the last lap at Homestead, and it is going to come down to mistakes. Dale Earnhardt Jr. ran second, 4.390 seconds behind his Hendrick Motorsports teammate. Joey Logano came home third. Neither Earnhardt nor Logano, however, had a prayer of beating Johnson, and they knew it. Johnson is the first back-to-back winner of the fall race at Texas since the race became part of the Chase in 2005. Johnson also tied Carl Edwards for most NASCAR Sprint Cup Series victories at the 1.5-mile track. Kasey Kahne finished fifth, followed by Brad Keselowski, Denny Hamlin, Kevin Harvick, Ryan Newman and Clint Bowyer. Harvick climbed to third in the series standings, but at 40 points behind Johnson and 33 behind Kenseth, it will take a miracle to put him back into the championship picture. The race was a disaster for Jeff Gordon, who entered the event third in the standings but blew a tire, hit the wall on Lap 74, finished 38th and fell out of contention for a possible fifth title. Gordon fell to sixth in points, 69 behind Johnson. 1. (3) Jimmie Johnson, Chevrolet, 334, $484211. 2. (7) Dale Earnhardt Jr., Chevrolet, 334, $337810. 3. (12) Joey Logano, Ford, 334, $251193. 4. (6) Matt Kenseth, Toyota, 334, $238776. 5. (11) Kasey Kahne, Chevrolet, 334, $180585. 6. (2) Brad Keselowski, Ford, 334, $204726. 7. (14) Denny Hamlin, Toyota, 334, $160960. 8. (19) Kevin Harvick, Chevrolet, 334, $175621. 9. (13) Ryan Newman, Chevrolet, 334, $161593. 10. (26) Clint Bowyer, Toyota, 334, $160968. 11. (33) Mark Martin, Chevrolet, 334, $161185. 12. (18) Greg Biffle, Ford, 334, $129760. 13. (5) Kyle Busch, Toyota, 334, $153368. 14. (15) Martin Truex Jr., Toyota, 334, $141685. 15. (4) Paul Menard, Chevrolet, 333, $139476. 16. (9) Ricky Stenhouse Jr. #, Ford, 332, $153896. 17. (31) Kurt Busch, Chevrolet, 332, $133505. 18. (23) Parker Kligerman(i), Toyota, 332, $124868. 19. (25) Elliott Sadler(i), Toyota, 331, $114235. 20. (16) Juan Pablo Montoya, Chevrolet, 331, $134199. 21. (10) Marcos Ambrose, Ford, 331, $132674. 22. (21) Austin Dillon(i), Chevrolet, 331, $121243. 23. (36) Kyle Larson(i), Chevrolet, 331, $126943. 24. (20) Jeff Burton, Chevrolet, 331, $112485. 25. (30) Danica Patrick #, Chevrolet, 331, $104735. 26. (28) David Gilliland, Ford, 330, $115543. 27. (17) Aric Almirola, Ford, 330, $140521. 28. (39) David Reutimann, Toyota, 330, $112832. 29. (32) Trevor Bayne(i), Ford, 330, $103085. 30. (43) JJ Yeley, Chevrolet, 329, $103875. 31. (24) Jamie McMurray, Chevrolet, 329, $126005. 32. (38) Travis Kvapil, Toyota, 329, $107435. 33. (27) Casey Mears, Ford, 328, $107235. 34. (37) Landon Cassill(i), Chevrolet, 328, $99010. 35. (42) Dave Blaney, Chevrolet, 326, $98810. 36. (41) Joe Nemechek(i), Toyota, Rear Gear, 190, $98580. 37. (1) Carl Edwards, Ford, Engine, 187, $152951. 38. (8) Jeff Gordon, Chevrolet, 147, $139736. 39. (34) Josh Wise(i), Ford, Vibration, 145, $88800. 40. (22) Bobby Labonte, Toyota, Engine, 144, $92800. 41. (40) Timmy Hill #, Ford, Engine, 125, $80800. 42. (29) David Ragan, Ford, Engine, 81, $84800. 43. (35) Michael McDowell, Ford, Vibration, 27, $73300. Average Speed of Race Winner: 151.754 mph. Time of Race: 3 Hrs, 18 Mins, 05 Secs. Margin of Victory: 4.390 Seconds. Lead Changes: 28 among 10 drivers. Lap Leaders: C. Edwards 1-9; J. Johnson 10-15; C. Edwards 16; M. McDowell 17; C. Edwards 18-32; J. Johnson 33-57; Kyle Busch 58; D. Ragan 59; C. Edwards 60-70; J. Johnson 71-74; C. Edwards 75; B. Keselowski 76-79; C. Edwards 80; B. Keselowski 81-91; J. Johnson 92-124; M. Kenseth 125-126; J. Johnson 127-171; M. Kenseth 172; J. Johnson 173-189; Kyle Busch 190; J. Johnson 191-239; R. Newman 240-241; B. Keselowski 242-255; J. Johnson 256; B. Keselowski 257; J. Johnson 258-298; J. Logano 299; G. Biffle 300; J. Johnson 301-334. Leaders Summary (Driver, Times Lead, Laps Led): J. Johnson 10 times for 255 laps; C. Edwards 6 times for 38 laps; B. Keselowski 4 times for 30 laps; M. Kenseth 2 times for 3 laps; Kyle Busch 2 times for 2 laps; R. Newman 1 time for 2 laps; G. Biffle 1 time for 1 lap; M. McDowell 1 time for 1 lap; J. Logano 1 time for 1 lap; D. Ragan 1 time for 1 lap. Top 13 in Points: J. Johnson – 2,342; M. Kenseth – 2,335; K. Harvick – 2,302; Kyle Busch – 2,290; D. Earnhardt Jr. – 2,280; J. Gordon – 2,273; C. Bowyer – 2,273; G. Biffle – 2,269; J. Logano – 2,251; Kurt Busch – 2,246; C. Edwards – 2,226; R. Newman – 2,224; K. Kahne – 2,209.